CenTrak will bring its largest team ever to man our booth at the HIMSS Annual Conference 2014 in Orlando, FL next week. 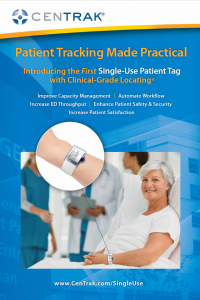 We look forward to meeting with current and future customers and partners to show off the new, transformational RTLS technology that we have developed over the past year: the first affordable single-use patient tag with Clinical-Grade Locating® capabilities! We are also excited to offer a new feature to our booth. This year, we have invited partner representatives to spend time showcasing their applications. Partner presenters will be standing by to answer questions about their product and how it integrates with CenTrak’s technology. HIMSS’14 Conference guests who visit booth #5645 at various times throughout the show will not only get to learn about the unique benefits of Clinical-Grade Locating™, but will also have the opportunity to see real-life examples of how our partner solutions increase patient safety, patient satisfaction and operational efficiency.These partners will be displaying a full range of CenTrak RTLS-driven solutions such as asset tracking, environmental monitoring, patient throughput, staff locating for nurse call and departmental workflow. Solutions that go way beyond simple tracking of “dots on a map” – these applications generate game-changing ROI, increase regulatory compliance and elevate patient care.